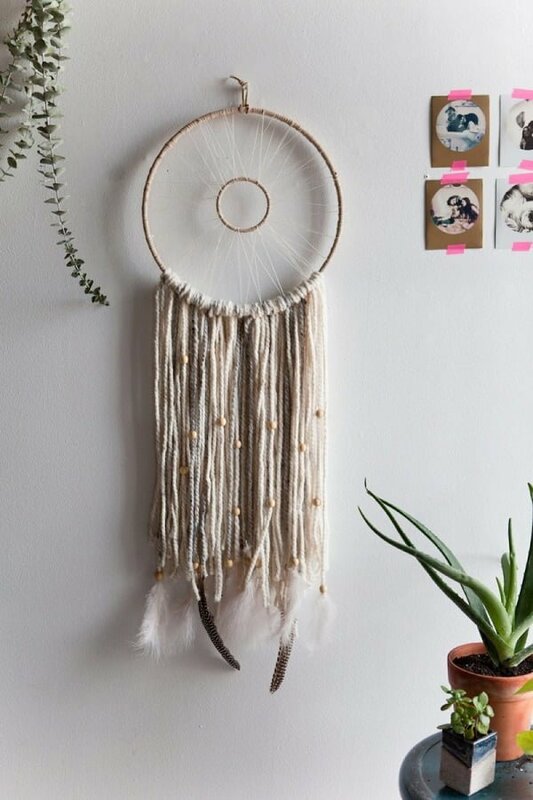 A DIY dreamcatcher makes wonderful bedroom decor, especially if there’s no accent headboard present. It can be an easy craft project as well as a little more complicated. Here are 15 brilliant ideas for you to choose from and match your level of skill. As a kid, I had a dreamcatcher in my bedroom. 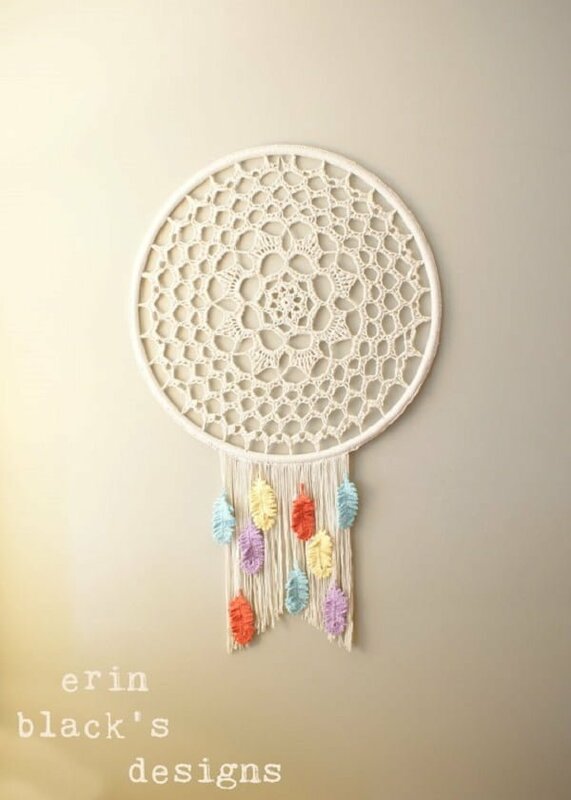 It was a beautifully crocheted dreamcatcher with feathers and there was something magical about it. I’ve encountered many more of them as an adult in many different styles. 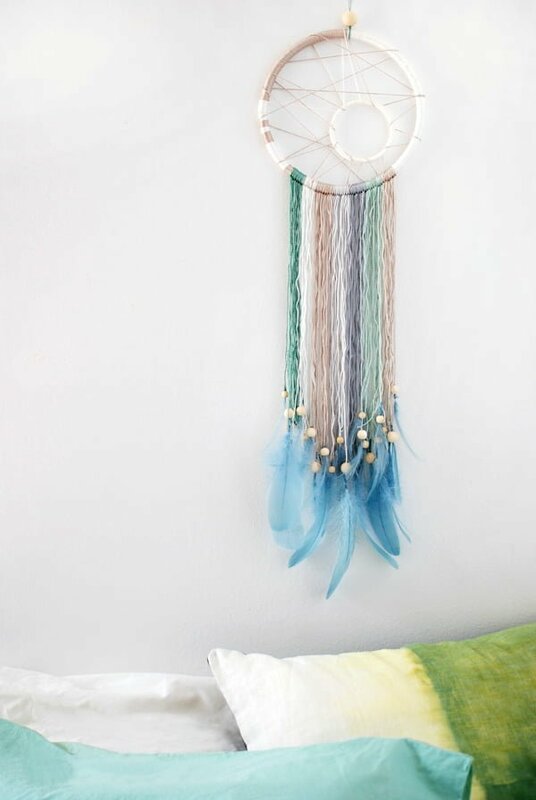 Whether you’re looking to make a dreamcatcher for sentimental value or a more modern look, these tutorials will get you there. Choose one that you like the most and start crafting. Remember that using your own creativity and adding your own unique details to these crafts will only make it better. The designs of dreamcatchers have evolved over time, influenced by trends and necessity. Here is an attempt to fuse this symbol of fantasy with modern aesthetics. The result is a minimalist pattern that should look amazing in contemporary interiors. This project also requires relatively few supplies so those who are interested in making their own should be able to start right away. Just get some hoops, wrap, thread, and yarn. Make it more interesting by adding beads and feathers. Hang it above your bed and let it work its magic. Who said circles are the only way to go? 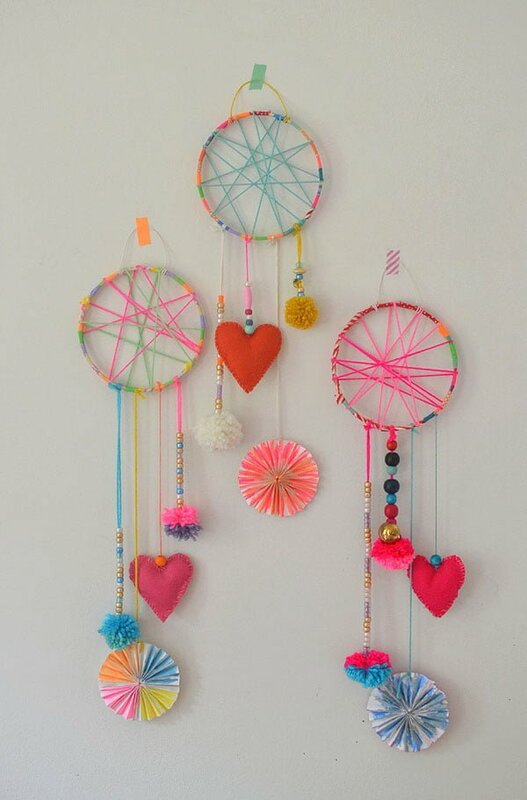 Dreamcatchers come in a wide variety of shapes and sizes. If you can imagine it, then you can make it. This is an excellent example of the triangular shape providing a distinctive appeal. The use of natural materials is also an attraction. Instead of using hoops like most do, this one utilizes dried up wooden sticks that can be found anywhere. Just break them into the desired lengths and tie up the ends with a secure knot. Place the strings at the base and accessorize with crystals, bells, or feathers. There is nothing quite as satisfying as making something together as a family. Here is a project that is great for both kids and kids-at-heart. It can also be a fun activity for art class and similar situations. In order to add color, the creator suggests using washi tape of various hues and patterns. The use of pastel and neon yarns is also a deviation from the typical neutrals and earth tones. Another way to make things more interesting is to attach unusual accessories at the bottom like tassels, hearts, and color wheels. There is no reason for this item to stay locked inside bedrooms. Some designs are attractive enough for display in a variety of settings including weddings and parties. They will surely charm the guests with their intricate details and undeniable beauty. Here is an example with artificial flowers along the hoop and delicate lace instead of rope. Trinkets are scattered across the weaves and hung at the bottom to give character to the pieces. Use whatever materials you already have to create the look for less. They will surely get a ton of comments from invited guests. Prepare for fall by making a charm inspired by the season. As much as possible, get materials from your immediate environment to reduce the cost and keep it authentic. The leaves tend to have a distinctive look during autumn. This project hopes to capture that fleeting glow. Dried twigs, acorns, and other found objects can be good additions as well. 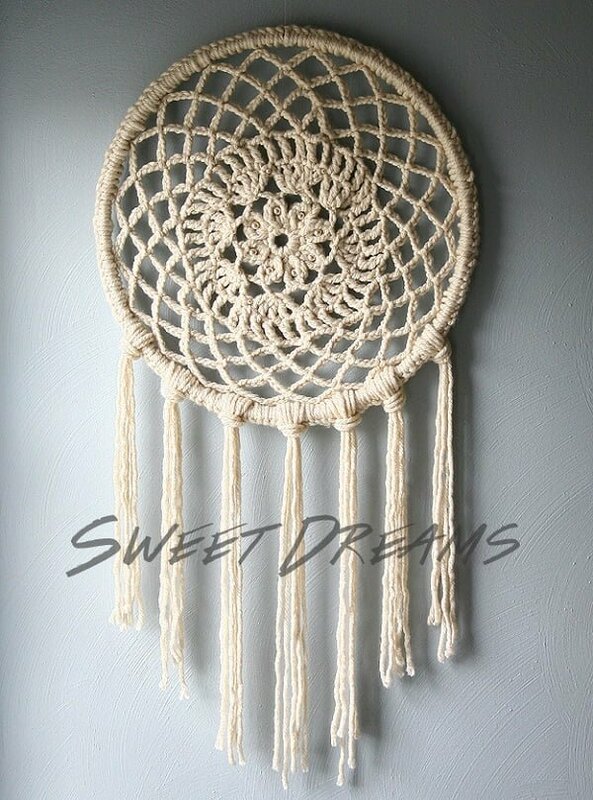 Another feature of this dreamcatcher is the presence of concentric circles with the rope weaving densely between them. Meanwhile, the lighter yarn should form a net inside the smaller hoop. It certainly has a rustic look that will make you feel closer to nature. From time to time, products catch our eyes only to break our hearts with their high prices. It can be hard to justify the purchase of charms that cost several hundreds of dollars each. However, you can still satisfy your cravings at a much lower outlay if you are ready to put in some effort. This tutorial shows how to mimic items from a popular shop in New York. The total cost? Anywhere between $25 to $35, depending on where you get your materials. The designs may seem fancy and complicated but they are actually easy to recreate. You can even tweak them to your liking. Most of these charms are flat since they are meant to stick close to a wall. Of course, you don’t have to follow this traditional design if you have better ideas. 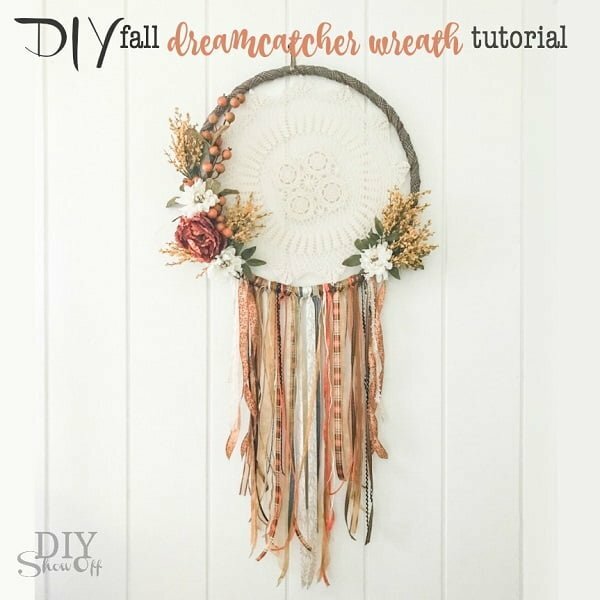 For instance, this blog shows how you can create a three-dimensional dream catcher that can then be hung from the ceiling. As a bonus, it also doubles as a DIY lampshade for your light bulbs. This eye-catching piece is a fantastic addition to any room. Place it on top of your bed, your study area, or your dining table. It will never fail to make you smile. What began as a sacred charm has evolved into so much more. Some are attracted to its supposed powers while others are attracted to its beauty. They have turned it into decorative pieces around their house and in gatherings. 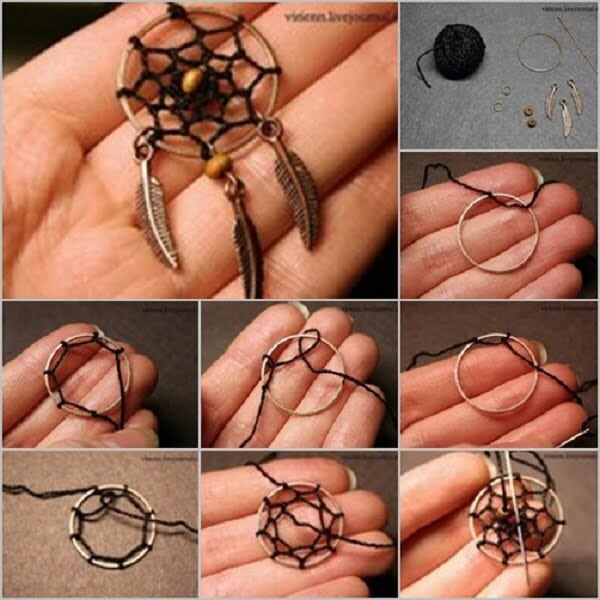 A few have even made jewelry pieces that resemble dreamcatchers. You could buy these in stores or create your own. It is not as daunting as you think, as shown in this blog. Just get a metal ring and a black thread for the body. Hang any small trinket at the bottom and you’re done. In the hands of a craftsman, simple objects can become impressive works of art. 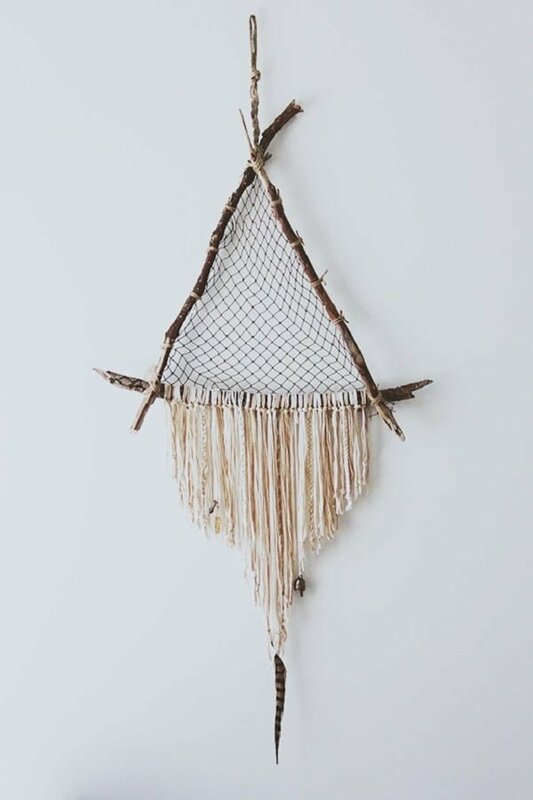 That is certainly the case with this incredible wall décor inspired by traditional dreamcatchers. The key feature is an intricate crochet pattern in the middle of the hoop. It radiates outward from the center, almost like a flower with several layers of petals. The pattern is available on Etsy as a digital download. This includes step-by-step instructions so readers can follow along. Note that this project requires an intermediate skill level to complete. If you are an absolute beginner, then start with a basic pattern. It is a constant challenge for new artists to give a fresh spin on old ideas. 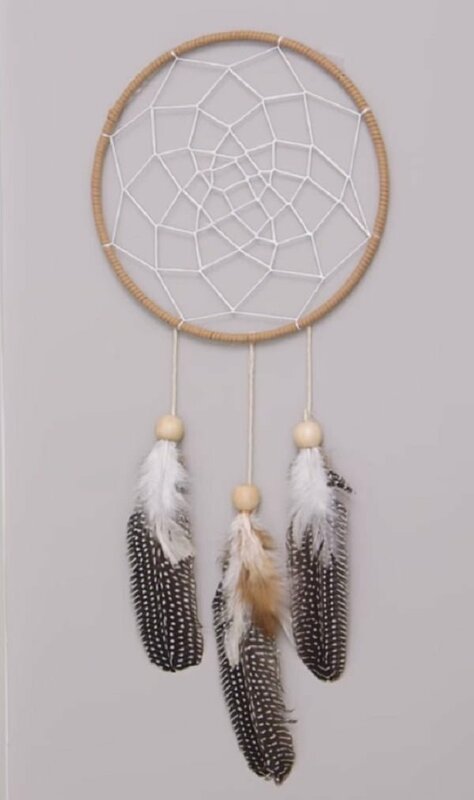 Iconic designs like that of dreamcatchers are being reimagined so that they can blend well with modern interiors, use better materials, and last a lot longer. This is a great example of an interesting color palette and a minimalist approach. There are no intricate weaves here making it friendly for beginners. The threads can go around the ring in a random way. They can simply hang from the bottom with preferred accessories at their tips. Despite the lack of complexity, the striking arrangement and understated elegance make this an attractive item. Homeowners will be proud to place this in their bedroom or beyond. 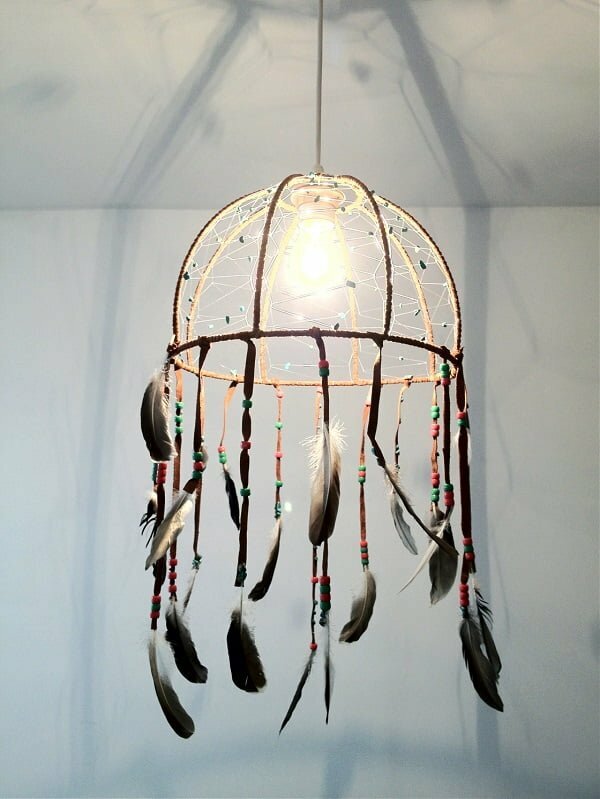 While these were originally meant to protect against bad dreams, you may also want to get one to catch your best dreams. This calls for an extra special creation with larger than life proportions just like this project. It does require quite a bit of skill because of the web pattern so novices might want to look elsewhere. An alternative would be to use several doilies to fill the gap. Sew them together and you can get great results. The materials are rather few, cheap, and easy to acquire. All you really need is an embroidery hoop and some yarn. You could also adorn it with your preferred embellishments. Making arts and crafts do not have to take a huge chunk of your time or a big slice of your budget. This project shows how quick, easy, and affordable it can be. 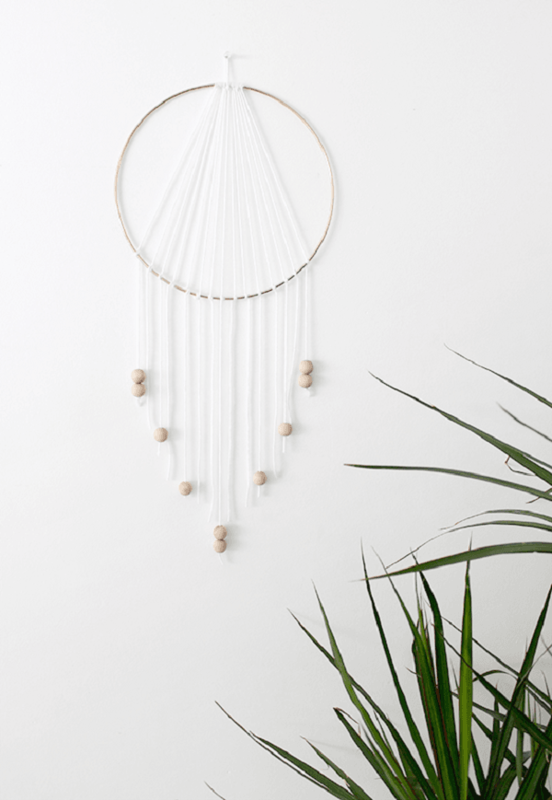 Dreamcatchers have been stripped down to the basic elements for fast assembly with minimal materials. All you need is a loop and a ball of yarn. It is a perfect example of the mantra “less is more”. There are no strict or complicated patterns to follow. Just tie knots from one end to the next to create an inverted fan. Put trinkets at the ends of the excess yarn if you have some. Hang this on any wall to decorate without making the interiors suffocate with too much detail. Dress up your plain door with ornaments. Wreaths are the perfect candidate with their bright colors and positive symbolism. In fact, some households change theirs every season to reflect the changes in foliage and harvests. Fall is a wonderful time to make one because of the colors of the season. Make it even more special by using an unconventional design. 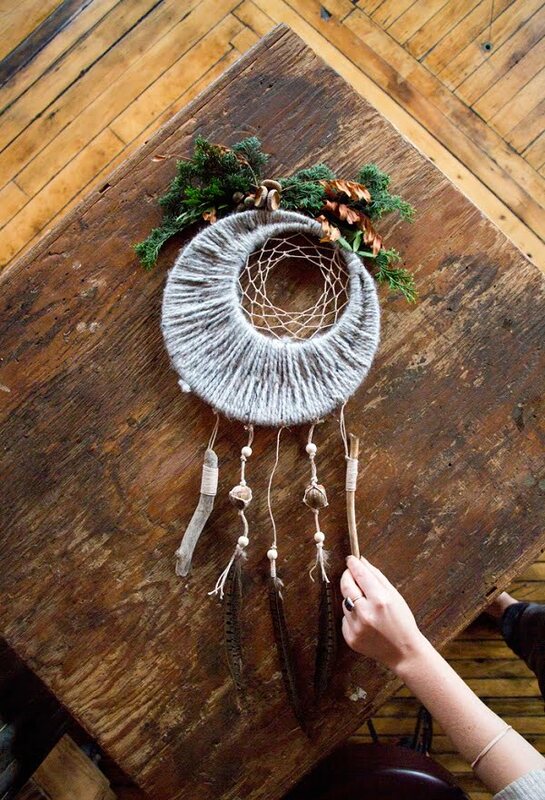 This DIY project fuses wreaths and dreamcatchers into a beautiful piece of décor. Just wrap a hoop with ribbon, stretch out a doily in the middle, secure assorted laces under the wreath, and arrange florals all around. Hang this on your door for a pleasant welcome every time you enter. Some things can look complicated at first glance but they are actually quite simple once you learn how they are made. This project is sure to impress your friends and family without making your break a sweat. The instructions call for straightforward tasks performed in succession to create a mirage of complexity. Indeed, you don’t even have to follow any patterns when wrapping the string around the concentric circles. As for the rope, just let its natural texture shine and punctuate with accessories. Although crocheted webs make striking dreamcatchers, they tend to be out of reach for novice crafters. It’s a good thing that there are plenty of other ways to create remarkable charms and ornaments. Modern designs are particularly beginner-friendly since they usually take a minimalist approach. The emphasis is on practicality and simplicity. For example, this project may be finished in under an hour if you have all of the materials on-hand. The web is probably the easiest part while the rest can be customized according to your aesthetics.